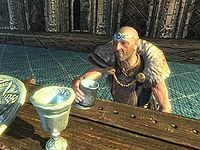 Skald is an elderly Nord and the initial Jarl of Dawnstar in the Pale. A militant supporter of the Stormcloak rebellion and fiercely loyal to its leader, Ulfric Stormcloak, he will be overthrown if the Imperial Legion prevails, and replaced by Brina Merilis. He has been Jarl for 35 years and is generally regarded as too arrogant and overzealous to the Stormcloak cause for the position. The majority of the townsfolk find his political fanaticism foolish and his personality unpleasant, including members of his court. Many would much prefer Empire supporter Brina Merilis as jarl. His attire reflects his status and personality and includes a full set of noble clothes with fur-lined boots and a silver and moonstone circlet. He carries a steel sword and a selection of upper-class items and gold. 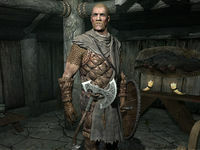 When you get near him, he will immediately get going on his life-long commitment to the Pale and his political stance: "I've been in charge of Dawnstar for over 35 years", "No Empire is going to take the Jarlship away from this Son of Skyrim", "The Pale will throw those Imperial backbiters up against the wall when they come for us", and "Skyrim will not bow to a false king any longer. Ulfric is the true king." When asked how Dawnstar stands in the civil war, he will be quite confident: "The Stormcloaks are destined to win this fight. Talos is with us, and when you fight under a Divine's blessing, victory is assured. Dawnstar has a history of being the site of battles that have crippled the fate of the Empire. I hope this remains true." As for the unexpected dragon threat, he will be equally confident: "The only reason dragons are attacking is because Talos is angry with us for turning our backs on him. As soon as we drive the Empire out of Skyrim, the dragons will vanish. Mark my words." His political viewpoints and obsession with the war will be apparent in everything he says, even when you deliver an innocent note on behalf of the workers at Anga's Mill: "What's this? Oh, that's right, the timbers from Anga's Mill. I swear, that Aeri and her men would make fine Stormcloak recruits. Pity we can't spare the lumber to conscript them. Here. Take this. For your time and all that." When you arrive in Dawnstar for the first time, the entire population will be plagued by nightmares, including Skald. If you have yet to start the quest Waking Nightmare, an annoyed Skald will greet you with "Unless you're here to solve this nightmare problem, I don't need you." He will then proceed to explain the situation: "That's right. Dawnstar. My Dawnstar is plagued with nightmares. I haven't slept properly in days. That priest of Mara who came here before you says the Divines will cure us. Well, until they do, I don't have any business to discuss with outsiders." 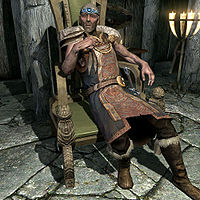 Once the quest has been completed, the curse upon Skald and his people will be lifted and he will thank you: "The nightmares in Dawnstar have lifted, and I hear you helped that happen. You have my thanks." He now has confidence enough to hand you a few smaller tasks; apparently, Skald hates giants and will ask you to set an example, starting the quest Kill the Giant: "Giants are a common problem in the Pale. The Empire always demanded I leave them be, but the Empire isn't here now. Go and slay one of the beasts. It should let them know that Dawnstar is not to be trifled with." If you deny to help, he will calmly say "You don't have time? Fine." If you accept, he will send you on your way with "I'm counting on you" and a piece of advice: "Good luck with the giant. Don't get stepped on." When you return with good news, he will be happy: "You've shown those monsters that they will no longer be tolerated in the Pale. Good work. Here, a reward from your Jarl." After this favor, he will be ready to make you Thane of the Pale, provided you have helped his people three times. This ends Skald's small string of quests. 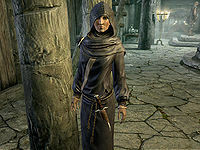 In Dawnstar, several citizens will tell you about the current Jarl. Mine owner Leigelf is Skald's only supporter, and even then, his praise of Skald seems sarcastic: "That would be Skald the Elder. He's been running Dawnstar ever since he was a boy, and he never lost that brat's attitude. Turned on the Empire first chance he got. Now we're all part of this rebellion." Beitild will also share her opinion: "That would be Jarl Skald the Elder. He's over in the White Hall, probably talking about Ulfric like he's the second coming of Talos." The aging Frida can remember Skald from way back, but still thinks him as a fool and prefers Brina Merilis: "Pfft. I'm the oldest woman in Dawnstar. Was here when the Skald the Elder was Skald the Younger. He's a fool, if you haven't met him already. Thinks Ulfric Stormcloak is invincible and spits dragon fire. The people here look to Brina Merilis when they need things settled. Real firebrand going up. Wasn't surprised when she joined the Legion." Lastly, Brina Merilis herself will comment briefly on the argument you visited in front of the White Hall: "The Jarl and I have our disagreements. Sorry if you had to overhear one of them" and "Skald supports Ulfric's rebellion, and he doesn't like having a couple of old Legionnaires living in his town. He's a fool. A dragon has attacked Helgen. Dawnstar needs the Empire now more than ever." Delivery: Deliver an item to an associate. 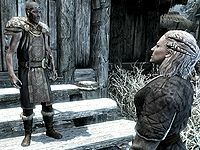 Kill the Giant: Do a favor for the Jarl of Dawnstar by killing a giant. Thane of the Pale: Gain the title of Thane of the Pale. "I didn't sign up to kill." Madena: "Skald, I've been meaning to ask you for a leave of absence. I wish to return to High Rock until this war is over." 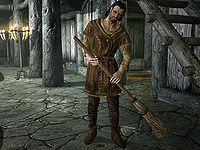 Skald: "You wish to leave now? In Skyrim's moment of triumph, just before we cast off the yoke of Imperial rule?" Madena: "Yes, that's exactly what I'm asking. I'm not a Nord, I'm a Breton, and I have no wish to fight this war." Skald: "I don't think so, Madena. There will be no deserters in this hold, and that's final." Skald: "Madena, can we count on your spells to assist us in this war? The Empire is bound to bring their battlemages against us." Madena: "I told you before, Skald, I have no interest in taking sides in this war. I've no desire to be killed." Skald: "What good is a court mage if she refuses to fight? Where's your sense of duty?" Madena: "When I came here, my only duties were to cure crop diseases and occasionally light a bonfire on holidays. I didn't sign up to kill." Skald: "Fine, but this isn't over Madena. We'll talk again." "By the Divines, I'm tired." "My only aim is to keep the peace." Jod: "My Jarl, I have concerns about the safety of Dawnstar." Skald: "Safety? Don't I have you to handle the town's safety? What is this about, Jod?" Jod: "You keep pledging more and more of our guard to the frontlines. The way this is going, we won't be able to defend our own borders." Skald: "Nonsense. The best place for our men is driving the Imperials back. I will ensure that men from Dawnstar get every opportunity for glory." Jod: "Glory is meaningless if they have no home to return to. I urge you to lower our commitments to the front until I'm sure we're safe." Skald: "I won't have you rob our soldiers of their chance to drive out the Empire. I'm done discussing this, Jod." Skald: "We are poised for glory, Jod. The Empire will never take Dawnstar while every last man, woman, and child here draws breathe!" Jod: "With respect, Jarl. You can't ask everyone to throw themselves against trained Legionnaires. Let's leave the fighting to the Stormcloaks." Skald: "You're right. Why dilute the glory with too many souls fighting over it? We'll drive out the Empire and be celebrated as heroes when we win." Jod: "If we win. This war is going to drag on for years. I can feel it. We need to prepare for a long struggle ahead." Skald: "Enough of your dire predictions! We will talk about this another time."